Every autumn, the first weekend in November, in Lazarevac small mining town 60 km far from Belgrade., in a very relaxed, homely and folk atmosphere, it happens the wine event where equally well entertain the visitors and winemakers too.. Only local wines, local food and folk music. 🙂 The story says that this festival was created by coincidentally, a group of winemakers was in a bar talking to it would be good if there is an event at which they would be able to show each other their new wines, new labels and to be a little merry in a relaxed atmosphere. At the next table were people from the municipality of Lazarevac who said something like “OK, we have an old sports hall, take it free and do something, our people like to drink wine as well as in the capital” Since then the organization of the festival participates together the Association of Winemakers of Serbia, Municipality of Lazarevac, and many winemakers, tourism workers and citizens as a volunteer. That is the reason than almost all wine makers from Central Serbia appear here, it is a matter of prestige and pride. 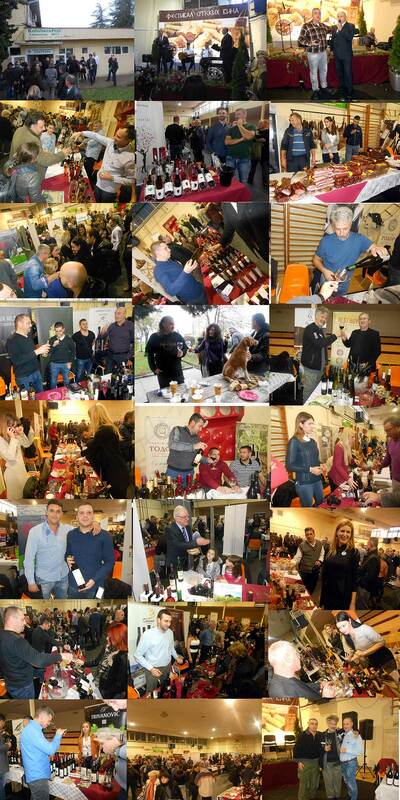 It was the same this year too, 65 wineries with a complete range of their wines and some very quality brandies, we had a lot to try. What new we could try ? The stars of the fair were winemakers from Zupa, Ivanovic winery has officially presented new “Prokupac 2015” and rare delicacy Rhine Riesling late harvest “Zanos 2013”. Also Botunjac winery with new “Sveti gral 2015″ (Prokupac grape) , Zivkovic winery, new white””Bela kap 2015” with new lable too , Raskovic winery with new “Rose 2015″” and last but not least Podrum Cokot winery with new “Ëxperiment 2015” (Prokupac). Among others, Janko winery with the whole range of its new white wines, and guests from Vojvodina Do kraja sveta winery which showed its good old wine in bottles with the new label design, and finally a special treat Kovacevic winery finally presented new Sauvignon Blanc 2015 i new Cuvee white . We had a great time, TNX to Nenad M. Andric, journalist and blogger, Vinovnik.rs for the invitation.